Having a ham on the table during a holiday gathering is pretty much a tradition in my family. Especially on Christmas Eve. They are great on their own, with a side of mustard, or my favorite is leftover ham chopped into cubes and reheated in a saute with onion and kale or chard and some dried cranberries. 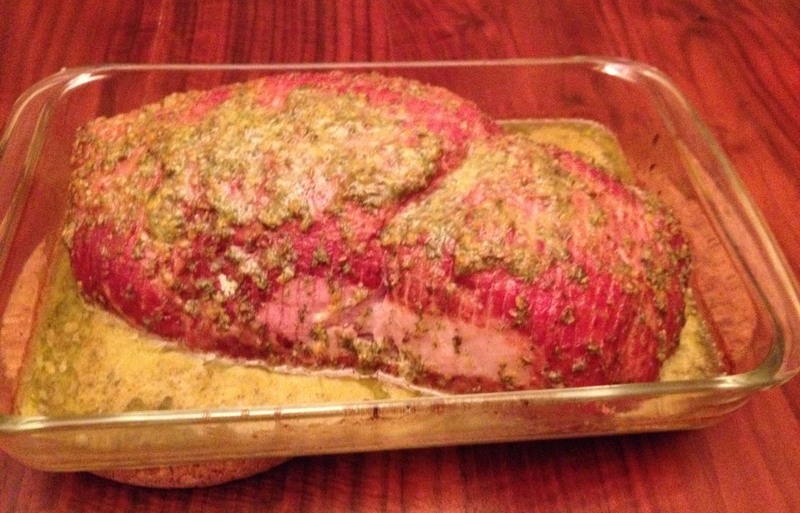 In this blog however, I developed a recipe to make the ham the star of the show. It’s got all the wonderful herbs present in a holiday meal, with orange and zest that compliment the ham’s saltiness. 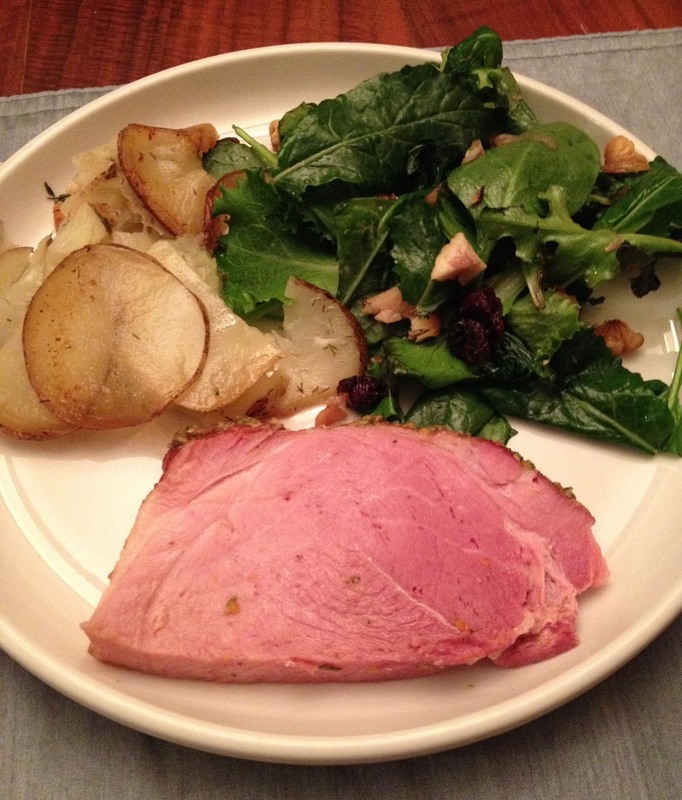 Here’s how I prepared the ham, as well as the side dishes I made to complete last weekend’s Sunday dinner. Preheat oven to 325°. To reheat your ham, I recommend using a roasting pan with a rack, one with a bottom that you can pour some water in to help the ham retail moisture while it reheats. A meat thermometer is a pretty good thing to have as well. (Tip: A 4-pound boneless ham will serve about 12 people, and this marinade will be enough for that size). Combine all the ingredients in a food processor and pulse until completely blended (mixture will be a pretty bright green). Paint the ham with the mixture using a BBQ brush. (You can also pour it over or use your hands, but a brush will coat the ham nicely. Set aside while you prepare your side dishes. 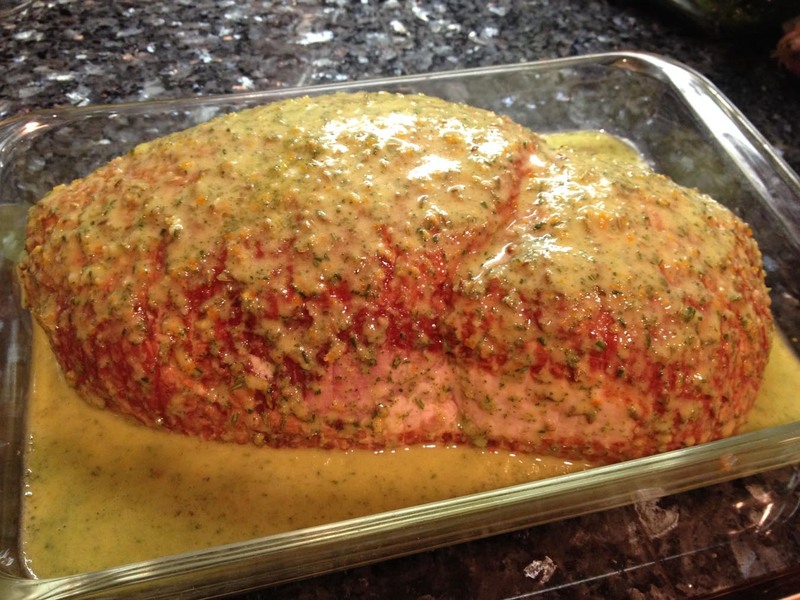 Cover the ham with aluminum foil and place in the oven. Bake until the internal temperature reaches 140° (Allow 7-8 minutes per pound). Remove the foil and place the oven on broil. Leave in for 2 minutes. This will give the top of the ham a nice finish. 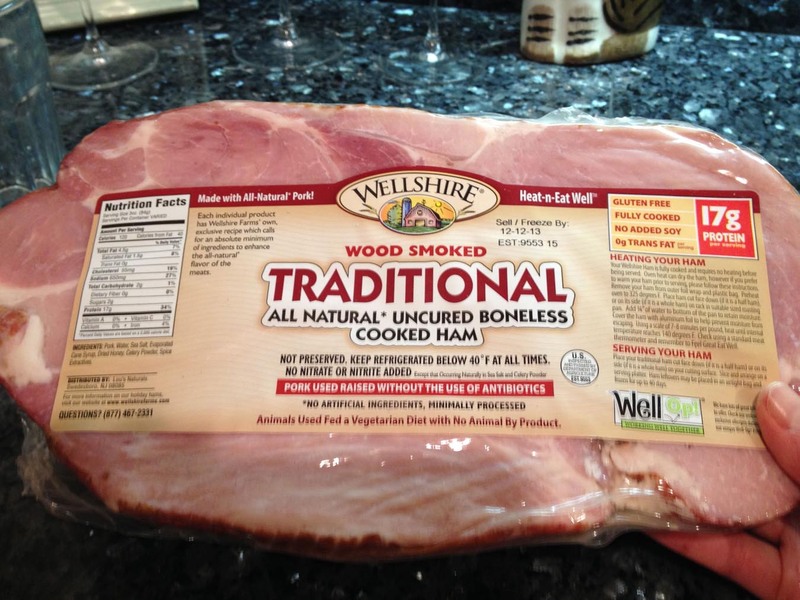 Here is a link with videos to Wellshire Farms entire line of hams. Free of nitrates, no artificial ingredients or preservatives! The natural wood smoke and rich tasting ham make a savory combination. You can get creative with your own unique glaze. Ham lays flat for ease of cooking and carving. (This ham is wrapped in clear packaging, other varieties of Wellshire Hams are wrapped in red, gold, and silver foil). For other great ideas and information on ham, you can check out the Whole Foods Market recipe ideas here. You can find Wellshire Farms on Facebook here. To save yourself time, you can order your ham online by heading to Whole Foods Market’s online shopping cart here. The other dishes in the photo above will be forthcoming over the next week (hopefully): Pommes Anna and a wilted spinach & kale, chestnut, & cherry salad with roasted shallots. Happy holidays! This entry was posted on December 17, 2013 by cavegrrl. It was filed under Recipes and was tagged with Christmas, dinner, holidays, New Years, recipes, Wellshire Farms, Whole Foods Market.